Based in Sarawak, Malaysia. Thomas belongs to an indigenous ethnic group in Sarawak. 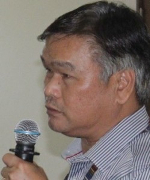 For more than 30 years, he has worked closely with communities to promote the recognition and protection of land rights, traditional resource use, human rights, and environmental conservation in Sarawak, Malaysia, notably by strengthening networks and alliance-building among indigenous peoples at the local, national and international levels. He was until recently an executive council member of the Asia Indigenous Peoples Pact (AIPP), as well as a Member of the Central Executive Committee of Jaringan Orang Asal SeMalaysia (JOAS), a national network of indigenous peoples of Malaysia. Thomas is a coordinating committee member of various local networks in Sarawak that advocate for the recognition and protection of indigenous customary rights to lands and resources, and for the promotion of development that is culturally appropriate, socially just and environmentally sustainable. Thomas currently serves as an indigenous peoples’ focal point for Asia and as a member of the Coordinating Committee of the GEF CSO Network.